Can we all agree: Happy 99th birthday to my Aunt Sylvia. Can we all agree, with one stroke of the pen Donald Trump’s has made a mockery of both the Statue of Liberty and the constitutional guarantee of freedom of religion? It didn’t take long for someone to challenge the new rule. Can we all agree the Republican party may be just as appalled at Donald Trump as the rest of us, but they have no idea what to do about it? Can we all agree, watching Mr. Trump’s press conference with British leader Theresa May did nothing to bolster our confidence that he has a clue about international relations, beyond his own personal businesses? Can we all agree, the GOP seems to have a sudden case of budget amnesia about the $10 trillion budget deficit they are about to create? Can we all agree the first lawsuit against the Trump administration, is just the first attempt to make his tax returns public, and may be the first step toward impeachment? Expect many more. 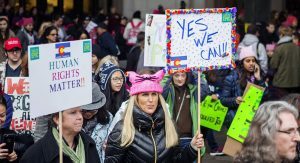 Can we all agree the signs held by protestors at the Women’s March last weekend may have been the best part of the event? Can we all agree the fact that the protest so enraged the President that he continues to lie about the size of the crowd, just makes it more satisfying? Can we all agree the women’s march was the most impressive protest we’ve seen since the 60’s? Can we all agree, it will be tough to maintain the movement’s momentum since there is no real leader, but as long as Mr. Trump continues to alienate the majority that opposed his election, it will have legs, as they say. Can we all agree California Governor Jerry Brown will not be the last public official to oppose Mr. Trump on climate change and sanctuary cities. Can we all agree the idea of building a wall on the Mexican border was great for the campaign trail but it has nothing to do with border security. Can we all agree putting pressure on department heads and forcing resignations is not the best way to run the government? Can we all agree Mr. Trump’s open lies are just one more symptom of his personality disorder? Can we all agree the Mexican President was right to cancel his visit to the US? Can we all agree that backing torture as an interrogation technique puts our country in the same classification as the dictators and despots we have fought for decades? Can we all agree the Dutch takedown of Mr. Trump is among the funniest to pop up on the internet? Can we all agree, no-one is surprised James Comey will be retained as FBI chief, now that he’s a trusted campaign aide? Can we all agree, the thought of an American president sending troops to a major city, reminds us of the desegregation era we all thought had ended? Can we all agree, the President’s preoccupation with non-existent voter fraud just undermines our Democracy? Can we all agree, attempts to gag every federal employee will not be successful and this administration will face withering internal criticism from leaks? The fact that the employees will have the First Amendment on their side will make it tougher for Mr. Trump to defend his position. Can we all agree the Keystone Pipeline is not the path to energy independence? Can we all agree, it will be interesting to see which Democrat calls Mr. Trump a liar as he is addressing them in February? Can we all agree, the British parliament, should admit they have made a mistake and refuse to approve whatever Brexit plan Theresa May submits to them? Can we all agree Mr. Trump obviously gave Israel at least tacit approval to expand their West Bank settlements? Can we all agree Mr. Trump doesn’t seem to realize that the Holocaust Memorial is meant to honor the millions of Jews exterminated by the Nazis? Can we all agree there is no doubt Mr. Trump has no idea what abandoning the TPP will do to relations in the Far East? Can we all agree most other politicians would have offered at least some kind words of support for tornado victims, but apparently Mr. Trump, didn’t notice the event? Can we all agree Mr. Trump must be happy Alec Baldwin gave him a week off from SNL? Can we all agree, it’s a bit late for the New York Times to decide they’ve been too leniet with their coverage of Mr. Trump? Can we all agree that Syria is now just a Russian outpost in the Middle East? Can we all agree it may not be too long before our Congress starts to look like the one in Turkey? Can we all agree, rumors that Facebook CEO Mark Zuckerberg is contemplating a political career is just one more example of the strange, strange world created by Mr. Trump? And this week’s good read involves a Trump supporter and a $450 tip. and finally – a farewell to Mary Tyler Moore, who was so much more than just another TV star. Can we all agree that the new President’s inaugural address did nothing to create a sense of unity in the nation, even among his supporters? Can we all agree his first executive order, allowing states to ignore parts of the Affordable Care Act, will create confusion and do more harm than good? Can we all agree that with Mr. Trump’s new slogan, it’s clear world leadership will fall to Britain’s Theresa May and Germany’s Angela Merkel? Can we all agree Mr. Obama’s last video message tried unsuccessfully to leave his supporters with some hope? Can we all agree the FBI did a pretty fair job of making sure no-one would notice they are investigating ties between the Trump campaign and Russia, by announcing the probe a day before th inauguration? Can we all agree Mr. Trump will not be happy with the comparison of his inaugural crowds with those of Mr. Obama? Can we all agree, despite Mr. Trump’s efforts to prohibit the National Park Service from estimating crowd sizes, it’s obvious the crowd for the women’s march will also be march larger than his? Can we all agree comparisons between Mr. Obama’s extraordinarily high approval ratings and the extraordinarily low ratings of Mr. Trump are inevitable? Can we all agree, speaking of comparisons, it seems Mr. Trump needed Mr. Obama’s inspiration for his inaugural cake? Can we all agree the idiots who decided to destroy buildings in Washington DC had nothing to do with the protests that will mark the rest of Mr. Trump’s term? Can we all agree many world leaders, except probably Vladimir Putin, will not sleep well until Mr. Trump has left office? Can we all agree it didn’t take long for the Trump minions to begin expressing their views, as went to work deleting large portions of web pages dealing with climate change and government regulation? Can we all agree, deleting climate change information is significant, since it comes just days after NASA announced that 2016 marked the third straight year global temperature reached record levels? Can we all agree that it’s nice to see an impeachment website starting on Day One? Can we all agree the Trump Hotel will be the starting point for every ethics inquiry over the next four years? Can we all agree this weekend’s Saturday Night Live show may have a record audience? 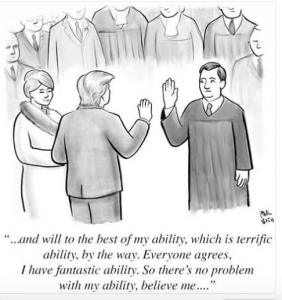 Can we all agree we will have to get used to more lawsuits and depositions by Mr. Trump? It’s only a matter of time before one of them results in release of his tax returns. Can we all agree that doesn’t even include the ethics issues his cabinet members will face? Can we all agree Mr. Trump’s cabinet picks including Mr. Mnuchin, Mr. Perry, Mr. Price, Mr. Pruitt and especially Ms Devos did not aquit themselves very well this week? Can we all agree we dying to know what’s in the Tiffany box Mrs. Trump gave to Mrs. Obama? Can we all agree after seeing the hearings this week the two cabinet posts approved on Friday were the least objectionable? But that’s not saying much. 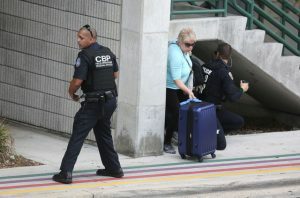 Can we all agree it appears some Trump policies will start very soon with workplace immigration raids and a reduction in funding for the arts? Can we all agree it will be impossible for the GOP to live up to Mr. Trump’s call for “insurance for all’ when they vote on repealing the Affordable Care Act? Especially when they see the costs. Can we all agree the friendship between Mr. Trump and the legislative branch will be tested soon when he’s asked to approve a measure repealing many of Mr.Obama’s regulations and also restricting his own executive power? Can we all agree we’re not sure why the extradition of a Mexican drug lord took place just before the new President took office? Can we all agree it’s remarkable that at least 10 people have been rescued from the avalanche that busied an Italian hotel? Can we all agree that America may now be the least safe place in the world as California sets a record for gun permits issued? Can we all agree most conservatives don’t seem to understand that shortening a sentence means Chelsea Manning is still guilty? Can we all agree that despite Mr. Trump’s portrayal of the US economy, we have just about reached full employment as defined by economists? Can we all agree Mr. Putin is turning in to his SNL caricature? Can we all agree the Senegalese ‘invasion’ of Gambia would be big news, were it not for our new President? Can we all agree the end of the search for Malaysian airliner leaves the world baffled? Can we all agree our dreams of running off to join the circus may have finally ended this week? The passing of the last man to walk on the moon and the World Champion Chicago Cubs’ visit to the White House. Can we all agree, it’s hard to believe the GOP is so focused on repealing the Affordable Care Act, that they are willing to disrupt the lives of the 23 million Americans who know it has been a success? Can we all agree, no matter what you think of the current administration, it’s improper for an incoming administration to conduct diplomacy before they are actually in charge? Can we all agree it would be nice to believe that Speaker Paul Ryan was was outlining Donald Trump’s immigration policy when he assured an immigrant family they would not be deported? Can we all agree the Justice Department probe of FBI director James Comey will end as soon as Loretta Lynch leaves office, but that won’t stop the Democrats from giving Mr. Comey a a piece of their mind? Can we all agree Mr. Trump’s plan to put his sons in charge of his businesses does nothing to allay fears that he will act in their best interests rather than in the best interests of the United States? Can we all agree appointing his son-in-law to a White House posts just reinforces the view that the family business interests will always be paramount ? Can we all agree the salacious charges against Mr. Trump may not be verified, but they are pretty easy to believe for many Americans? Can we all agree the appearance of Mr. Trump’s attorney, who showed up to justify his actions, was among the most cringe-worthy parts of his press conference? Can we all agree Buzzfeed has taken a lot of criticism for publishing the material, but that’s the altered reality Mr. Trump has created? Can we all agree the contrast between Mr. Obama’s final speech in Chicago and Mr. Trump’s attempt at a press conference was remarkable? Can we all agree a large segment of the American public agrees with the government ethics chief, regarding Mr. Trump’s latest plans for his businesses? Can we all agree the intimidation of the government ethics office will get more serious as Mr. Trump continues to defy the advice of ethics attorneys on both sides of the political spectrum? Can we all agree we’re still not sure if Mr. Trump really believes the Russians tried to influence the election? 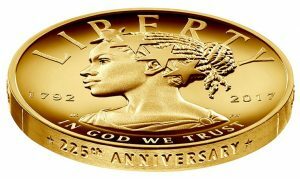 Can we all agree the new Lady Liberty on the $100 gold coin is sure to spark protests from the racists in this country? Can we all agree China’s addiction re-education camps sound a lot like the treatment camps some conservatives have proposed for anyone afflicted with the ‘disease’ of being gay? Can we all agree the Russians have a novel approach to eliminating smoking – make it illegal for anyone who has not already started? Can we all agree decriminalizing domestic violence, as Vladimir Putin ordered, is not the hallmark of a civilized society? Can we all agree it’s easier to charge foreigners from Volkswagen or Takata with criminal activity in product liability cases, than it is to hold US companies liable for breaking US laws? Can we all agree it will take years and require constant monitoring to make sure the Baltimore and Chicago police make progress in eliminating the deeply ingrained practices which have caused so many problems? Can we all agree Mr. Obama latest new Cuba policy may please that country’s leaders, but will not be popular with citizens who make it to our shores? Can we all agree we’re not surprised that Fox News secretly settled a sexual harassment claim against Bill O’Reilly – two lawsuits in 12 months might have been more than the network could handle? Can we all agree Mr. Trump’s handling of the L.L. Bean controversy proves once again, he doesn’t understand the role of the President? Can we all agree we’re amazed Mr. Trump hasn’t caused another international incident by tweeting about China’s lone aircraft carrier sailing through the Taiwan straight? Can we all agree Mr. Trump’s biggest problem might be convincing his own cabinet that he knows what he’s doing? Can we all agree it’s nice to hear about a company planning to create 1o0,000 new jobs, with no mention of government interference? Can we all agree it’s great that 42% of California is drought free, now we can start worrying about Massachusetts and Europe? Can we all agree Meryl Streep got all the publicity for her critique of Donald Trump, but Hugh Laurie really got the anti-Trump show started? Can we all agree Mr. Trump’s response was just embarrassing? Can we all agree you could have predicted the outcome of a California University event featuring a racist editor and a money hungry drug executive? – Yes, protests ended the session before it even got started. If you don’t believe Joe Biden was surprised to receive the Presidential Medal of Freedom, you should nominate him for a best actor award.